We are a licensed and registered agent of ARLA (Association of Residential Letting Agents), NAEA (National Association of Estate Agents) and a member of TPO (The Property Ombudsman), giving you complete peace of mind. Introduce and vet prospective Tenant; apply for references through Homelet Referencing Agency, prepare the tenancy agreements; advise on legal requirements, advise on inventories, changes to utility accounts; collect the deposit and rent, pay the balances to the Landlord’s account. Our dedicated lettings team is committed to offering the highest levels of care and attention, ensuring that the tenancy runs as smoothly as possible, without giving you any hassle or stress. Our management team is regularly trained to keep them abreast of developments in the law affecting lettings and specifically to protect your interests. Our aim is to achieve the best possible rent for your Property, find a suitable Tenant for your Property, who will be fully referenced and will pay rent on time and look after your Property. 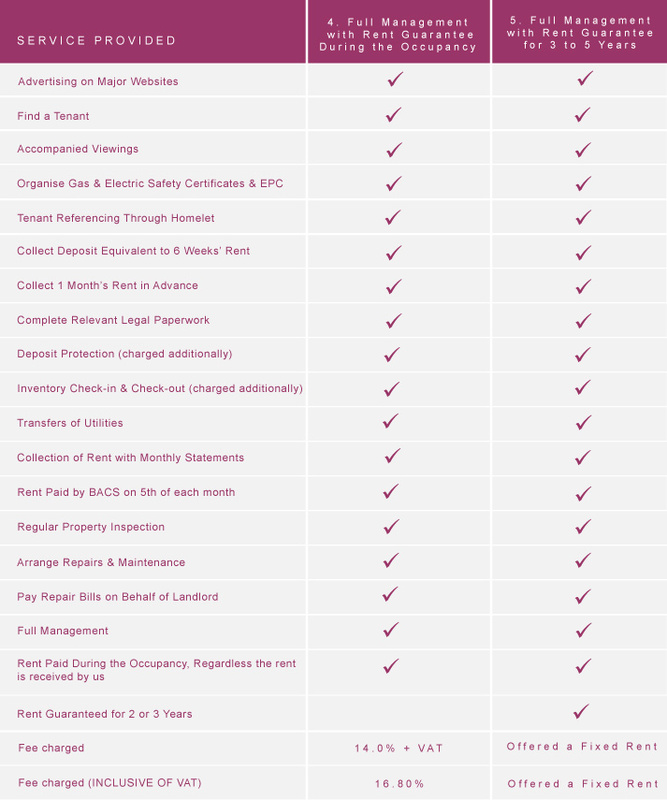 Our Rent Guarantee Scheme provides Landlord complete peace of mind. We offer five different levels of services to our Landlord. Fees are due and payable immediately on a Tenant entering into a tenancy agreement with the Landlord. It is agreed that Woodend Estates will deduct such fees and commission due from rent monies collected. 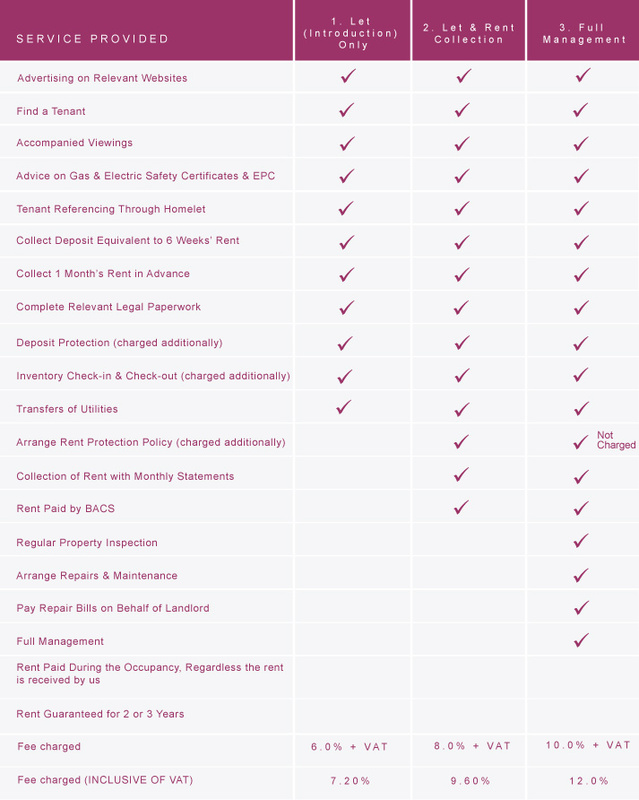 Register landlord and tenant details and protect the security deposit with a Government-authorised Scheme. Provide the tenant(s) with the Deposit Certificate and Prescribed Information within 30 days of start of tenancy. Arranging access and assessing costs with contractor; ensuring work has been carried out in accordance with the specification of works. Arranging access and assessing costs with contractor; ensuring work has been carried out in accordance with the specification of works, retaining any warranty or guarantee as a result of any works, obtaining more than two contractors quotes. Review rent in accordance with current prevailing market condition and advise the landlord, negotiate with tenant, direct tenant to make payment change as appropriate, update the tenancy agreement, serve Section 13 Notice if tenancy is on a rolling monthly basis. An inventory of contents is strongly recommended at this offer the landlord better protection concerning the condition and contents of his property. This is a detailed list of what is in the property. It gives about the condition of each room and the contents of each room. We are happy to draw up a basic inventory on your behalf, but it must be kept in mind that the responsibility of checking the accuracy rests with the landlord. A professional inventory can be arranged & the quotes can be provided. Agree with tenant check out date and time appointment, instruct inventory provider to attend, negotiate with landlord and tenant any disbursement of the security deposit, return deposit as agreed with landlord and tenant to relevant parties, remit any disputed amount to Scheme for final adjudication, unprotect security deposit. Instruct contractors; obtain quotes; organise repairs /replacement/cost of any broken or missing items. There must not be any problems with damp or serious disrepair and it must be safe. All lifting wallpapers are to be stuck back. Make sure carpets or floorings are fitted and secure. There must not be any Polystyrene Tiles on any of the ceilings in your Property, these are fire hazard. They melt quickly then they spread a fire. The garden should also be left tidy and well maintained. All garden and cleaning equipment should be provided. Sheds or garages should be empty. All Landlord will need to provide an EPC to Tenant, the first time you let or re-let your Property after 1st October 2008. The main wiring, sockets, lighting and appliances must be checked by only electricians employed by the statutory Electricity Companies or who are registered by the NICEIC. The certificate must be valid for the period of the lease. The survey and service require to be carried out on an annual basis by only contractors approved by the Health and Safety Executive. This means engineers employed by the statutory Gas Companies, or individuals registered with GAS SAFE. The law states that there must be some means of fixed heating in the Property. All radiators must be securely fixed. The Landlord is required, throughout the term of the contract, to keep in place a service contract with either British Gas or another reputable contractor. The contract should provide for the maintenance of any space heating, central heating and water heating at the premises. Smoke detectors must be provided in all landing areas, in the living room(s) and in the area immediately before the entrance to the kitchen. Such units are to be operated via the mains electric circuit. The alarm must be provided near all gas appliances. Internal glass doors must conform to BS6206. There must be a Self-closing fire-check door to kitchen. Window restrictors must be fitted to all windows above ground level. The Tenant is responsible for paying Gas, Electric, Water, Council Tax. We take Gas and Electric meter readings and inform utility companies (except Telephone and TV Licence). It is important that you also make utility companies aware that you are no longer responsible for these bills after the Tenant moves in. Please ensure all beds with mattresses, headboards, three-piece suites and dining table chairs comply with the fire safety regulations. All furniture provided must be in sufficiently good condition to last the full Term of the Lease. We must be provided with 3 sets of keys for all external doors, together with 3 sets of window keys, shed keys and any external locking gates, two will be handed to the Tenant on occupation, and the other will be retained in our office for emergencies.